Mont is a geometric sans serif typeface created by Mirela Belova together with Svet Simov and published by Fontfabric which is available in 20 styles, 10 weights (from Hairline to Black) and their italics, over 700 glyphs, a wide range of OpenType features and multilingual support. It is characterized by very large x-height, pointed triangle bracket, horizontal terminals, geometric shapes and minimal stroke contrast. It was designed to be suitable for advertising, branding, display, logo, magazine, poster, print, web etc. Cannot miss it! 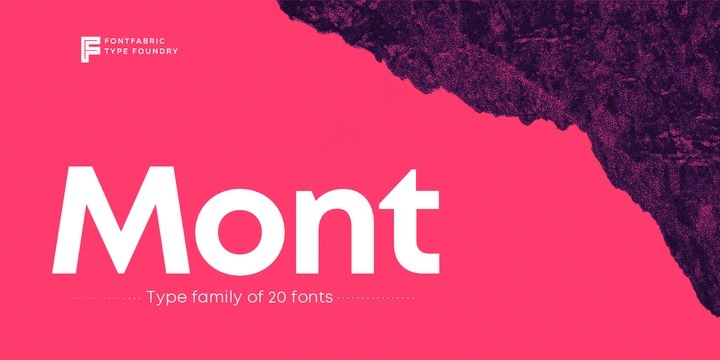 Note: “Mont” is a trademark of Fontfabric. A font description published on Thursday, January 18th, 2018 in Fontfabric, Fonts, Mirela Belova, Svet Simov by Alexandra that has 2,333 views.